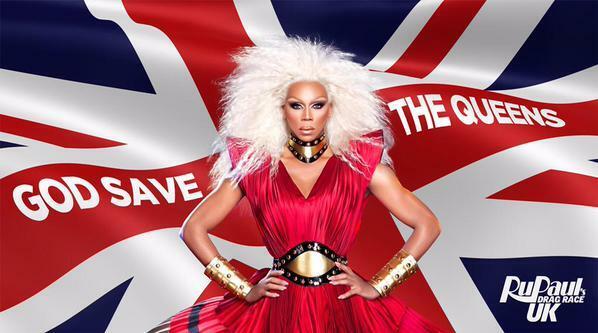 Supermodel of the world, RuPaul, has put the internet to work this morning with rumours of a UK version of her hit reality show, ‘Rupaul’s Drag Race’. The phenomenon has just ended it’s eighth season (7 seasons and All-Stars) in the USA, drawing massive international attention to the talents of American drag performers and, of course, RuPaul’s personal brand. Rumours of a UK series have been flowing since Michelle Visage, permanent judge on the US version and RuPaul’s best squirrel friend, featured on Celebrity Big Brother UK. Television personality Jonathon Ross mentioned last year he had been developing a UK version with DJ drag queen Jodie Harsh, who soon after appeared in a series of web shorts for World Of Wonder – an affiliate of LogoTV, the home network of Drag Race. RuPaul had been mostly quiet on the plans, earlier this year announcing a search for a UK “drag ambassador” together with TruTvUK network, as opposed to open auditions for taping. The tweet from Ru is emblazoned with similar art work to the original US series and she has tagged TruTV in the post, suggesting this might just be the Realness (Available on iTunes).